the “find-your-voice” year | shrinking 2013. The purpose of this blog is to look forward, but it’s not in my character to do so without looking back. A lot can happen within the time frame of a year. There are victories and setbacks, significant moments and fuzzy stretches, wild adventures and small joys. The idea of reducing a year into a single, digestible entity is most likely implausible. But, were I to do so, were I to shrink 2013 into a chunk of significance, I think I’d call it my “find-your-voice” year. From a “life progress” standpoint, 2013 saw the end of my first year of graduate school and the rise of my second. My thesis project took shape and new life, I transitioned from Carman to Taylor Hall, and I completed two internship experiences that expanded my toolkit. There were sleepless nights of homework, belly laughs with students and friends, hall program successes and emerging leader struggles. Somewhere along the line, in the middle of all of it, I stopped thinking of myself as a sort of professional on training wheels and instead started focusing on the kind of professional I want to be. That’s part of it, I think. The notion of “finding my voice.” Figuring out my non-negotiable self. Digging deeper into my introspective understanding, yes, and asserting it a bit more confidently. I think almost everybody falls victim to the practice of devoting too much concern to the approval of others. I am certainly no stranger to this obstacle. At moments in 2013, I was challenged to disregard voices clamoring about my limits and shortcomings and Just. Move. Forward. That process required inner resolve. Self-certainty. Later, I challenged myself to return to those voices and listen for pieces of truth. That process required significantly more. I’ve written before about the experience of writing six-word memoirs. A social media project I initiated in undergrad relied on this very idea: If you could truly teach one thing (in six words) to every person in the world, what would that one thing be? 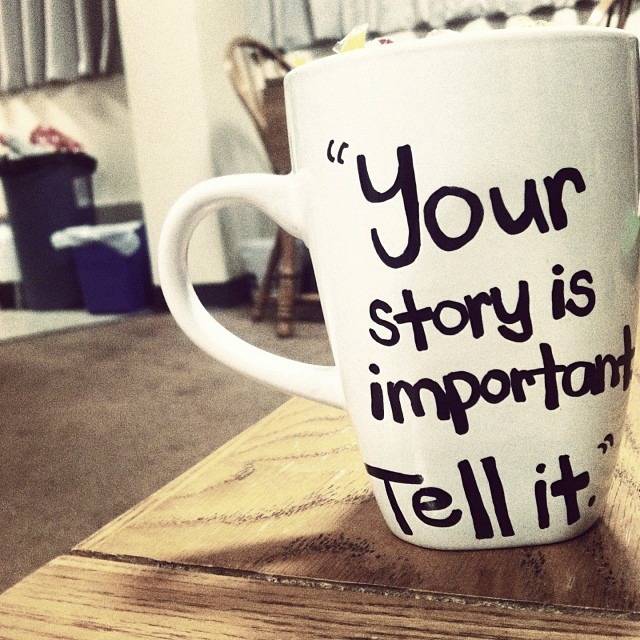 My answer, which rose to my heart the second the question was spoken, was this: “Your story is important. Tell it.” That realization lit into my life in the Fall of 2011, however. It was 2013 that had me thinking about the importance of a person’s voice. It reads like a concept from Creative Writing 100, but it strikes me as remarkably true nonetheless: Before we can tell our story, we have to find our voice. Looking back on 2013, scouring my memories and glancing through artifacts and photographs, I can see pieces of life that offered me the opportunity. Working with students through challenges big and small. Having the self-confidence to assume a leadership role. Fighting through shaky hands to challenge concerns that felt wrong. Encouraging students to be bravely themselves. Challenging myself to practice the words I preach. Taking ownership of projects and tasks that seemed outside my comfort zone. Committing to sharing my vulnerable self. Learning, learning, learning. A voice is not found in a day, and it is not found without struggle. 2013 was not always easy, but it prepared my soul to share its story. Other memories will color my 2013 as well. Sunny runs on the canal in Indianapolis this summer. Friendships and bravery. Love and light from the people in my life. Late-night card games. The loss of my dog (and beautiful friend) Winston. A year-long run journey of 1000 miles. My family, my friends. The Color Run. A mosaic of beautiful life. But the takeaway, the capital “B.D.” Big Deal, was the opportunity to find my voice. It was not easy, but it was needed. As usual, you are “right on” with your blog. Happy New Year to you dear Michael and may you continue to “grow’.